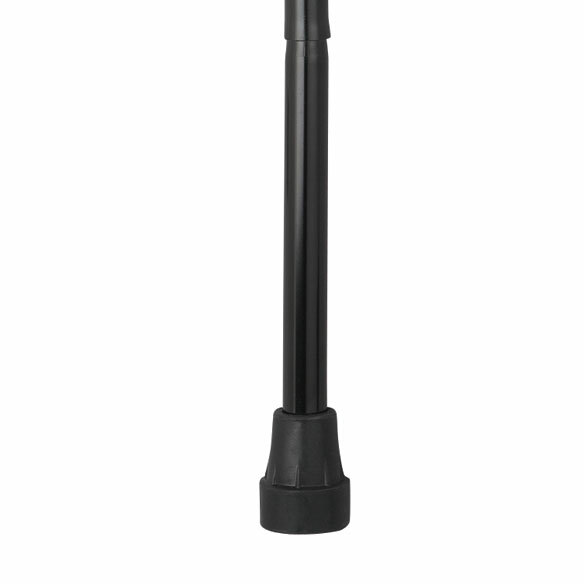 This folding cane features a raised, non-slip handle. 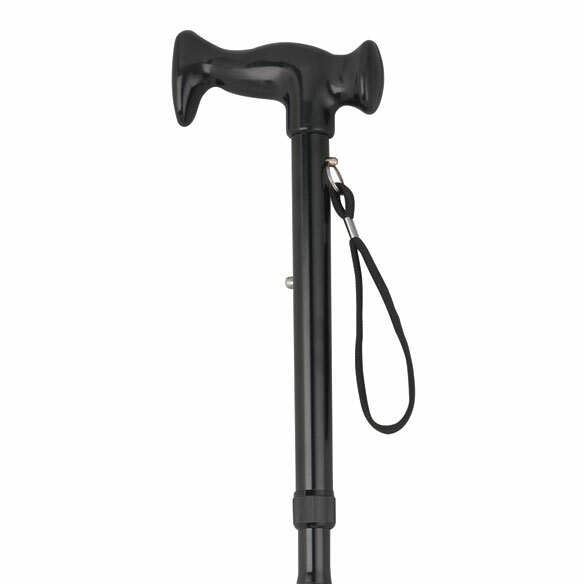 Adjustable cane, made of sturdy aluminum, enables you to walk with confidence; then, fold this walking aid compactly for storage or travel. 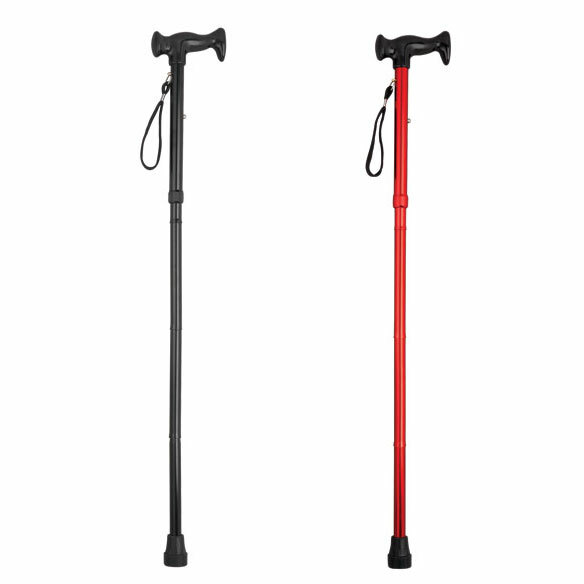 Folding adjustable cane supports up to 250 lbs. ; height adjusts from 33"-37". Great cane, and great price. This is my 3 rd cane I have purchased. I left one on a shooing cart, and when I got home I purchased one online right away. I do like the copper color. My backup cane is blue. Iam through paying almost $50 at another online site. I will always purchase from easy comforts. A very useful travelling companion. This cane makes long distant walking easy and safe; I've used it on sight seeing trips and it relieves the pressure from my back when you are standing listening to the tour guide. Stores perfectly in vehicle door compartment, which makes it easily accessible! IM DISABLED LOVE THE CONVENIENCE OF THE WRISTLET SO IT DOESN'T FALL LOVE THE FACT I CAN FOLD IT MAKING THE CANE EASY TO STORE IN A BAG OR PURSE. Very sturdy and adjustable. Cheaper than in stores and the same product. I especially like the way the cane pops into place as soon as leaving the storage bag. 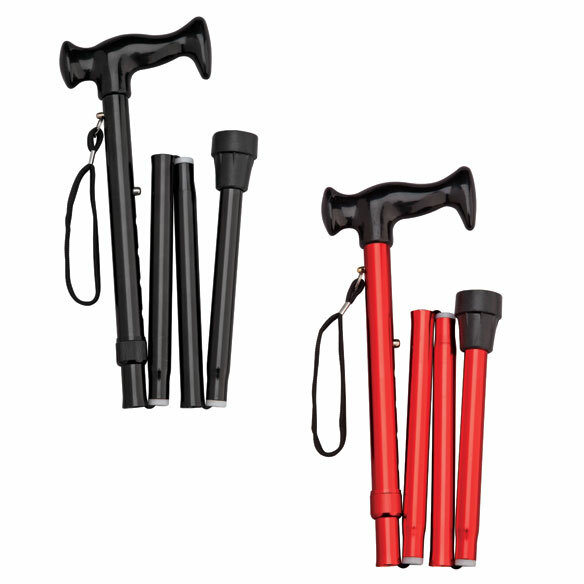 Great for traveling; easily opens to sturdy cane, easily folds to be tucked away. Very helpful the other day going to a funeral. Had to walk about one block from the church without the cane I'd never would have made it. The price was great compared to the one that I have already. Replaced a folding cane I used for years and this one has a better grip and love the wrist strap as my old one was not able to grip a ledge or table. Also, this cane folds in three places which takes up less room. Very happy with my purchase and look forward to using it for many years. I love the way it easily snaps into shape for access. I bought the cane for a buddy whom is disabled,and he is in love with it due to the flexibility of the folding cane and how superbly steady it is. Broken sidewalks....Learn the correct way to use it...gives support and saves energy. GREAT FOR ENCOURAGING WALKS ! ! Really good product. Held up great. Used to walk in an antique district, helped a lot. I am unable to stand for very long. Having this cane was great to help support myself. Love the convenience of the folding cane. Will easily fit in a tote or backpack. nice to be able to fold up the cane (it does come in a plastic bag/but did purchase the cloth carrying case). I take it with me to the hospital (when I go in wheelchair)/and use it in the restrooms there and at the grocery store (I use the motorized vehicle there. It is a great assest to be able to use a cain/and the convience of a folding one. The only drawback was it wasn't short enough (I am very short)/ but was able to adjust it (just idn't have the extra notch hole. (but able to make do: to suffice me/just fine. This cane is exactly what I been looking for! This folding cane easily fits into my pocketbook. Access for when my knee gives out on occasion. Would recommend it for young and old alike. Great for use with my scooter. Opens easily and quickly. However, it needs a better carrying case in cloth to keep it from opening up. I bought a bungy cord to put on it. It's great when I have walk in stores. I. Love. Folding. But. Don't hang that yet I wish. It came with its own sleeve instead of buying it separately. But does help me out. To big for me also to heve heavy. It was a nice cane but had to send it back . It only stays in folded-up state in heavy form-fitted case. Casually removing it made it jump apart suddenly. That could injure person or nearby objects. I will use it only as a traditional cane, never again folding it. It's to light for use and too slippery. Cane was wrapped in plastic that has a terrible chemical odor, permeates cane from top to bottom. Cane is unusable. Washed it, but can't get it off the tip. can't remove tip, glued solidly, so can't get a new tip onit. will try to ssend it back or get money back. My husband choose this. He is in need of s cane liked the idea of a folding cane. Hopefully will be more convenient to use rather than one crutch. Easier to store. They are handy for the days I don't feel up to a shower. i feel like a folding cane will help me when i travel. Because of the shape of the handle. Can hang it on counters, edge of table, etc. Red is my favorite color; I have 4 foldable, floral canes already but red will match some outfits! Ease of storage for traveling, light weight. I had and old cane like this and want a new one to make it my primary cane. I have ordered canes in the past and was very satisfied and am ordering one for three friends who need them. Basic color and the fact that I can fold for travel. Looks good, I need one, lets try it out. Fits in carry-ons when traveling. I love that style of hand grip, and they are hard to find recently. looks good for traveling and we will be cruising in the fall. To make airline travel easier. The ability to fold or unfold cane. Price was reasonable. Design and cost. It was an excellent value and choice. I was extremely happy with the purchase. I needed another folding cane. It is a great price so I can have a extra one to keep in the car. length of cane once folded? BEST ANSWER: Thank you for your question. The length of this item once folded is 12". We hope this information will be of help to you. BEST ANSWER: Thank you for your question. The Weight limit is 250 lbs. We hope this information will be of help to you. is the handle made of a non-slip material? BEST ANSWER: Thank you for your question. The hand grip is made of non-slip material. We hope this information will be of help to you.